Entertainment Weekly's 27 Female Authors Who Rule Sci-Fi and Fantasy Right Now Winner of the 2017 Nebula Award for Best Novel Finalist for the 2017 Hugo Award for Best Novel Paste's 50 Best Books of the 21st Century (So Far) List “The book is full of quirkiness and playful detail...but there's an overwhelming depth and poignancy to its virtuoso ending.” ―NPR From the former editor-in-chief of io9.com, a stunning Nebula Award-winning and Hugo-shortlisted novel about the end of the world―and the beginning of our future An ancient society of witches and a hipster technological startup go to war in order to prevent the world from tearing itself apart. To further complicate things, each of the groups’ most promising followers (Patricia, a brilliant witch and Laurence, an engineering “wunderkind”) may just be in love with each other. As the battle between magic and science wages in San Francisco against the backdrop of international chaos, Laurence and Patricia are forced to choose sides. But their choices will determine the fate of the planet and all mankind. 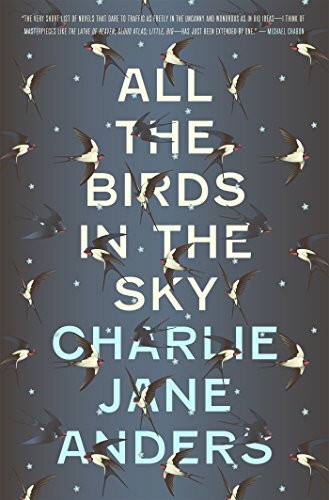 In a fashion unique to Charlie Jane Anders, All the Birds in the Sky offers a humorous and, at times, heart-breaking exploration of growing up extraordinary in a world filled with cruelty, scientific ingenuity, and magic.